Highways England acquired a 10,000 sq ft. retail unit on Ground and First floor of an otherwise residential building. 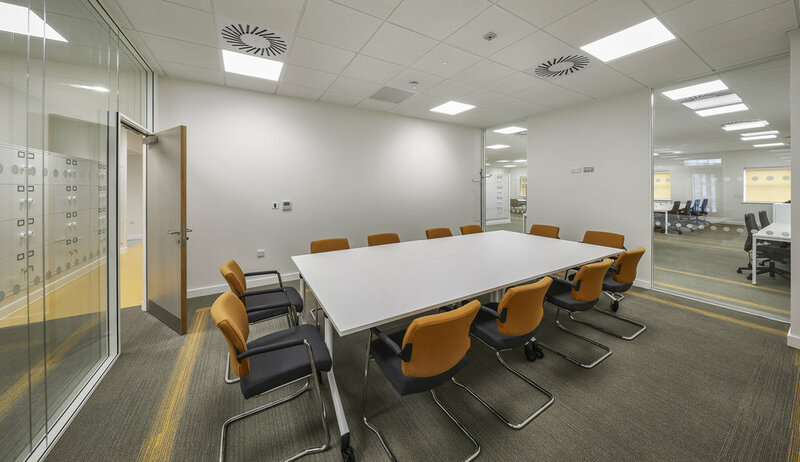 Hadfield Cawkwell Davidson were employed to completely refurbish the space and convert it into a modern inviting office space, incorporating new ways of working and an emphasis on sustainability and accessibility. Additional to the interior design work done in this scheme, new windows were punched into the existing façade requiring planning permission and allowing more usable office space to be created. The office layout fluctuates between the traditional and the contemporary with open-plan offices flowing into break-out spaces and informal meeting rooms. These contrasting styles of work-space are brought together to provide the buildings users with a flexible and nuanced space conducive to collaborative working. Also included in the scheme are a reception space, training rooms, welfare facilities showers, changing rooms and a state of the art 24 hour operation control room, all aimed at instigating professional and social interaction. The scheme is tied together through a core set of colours and graphics that criss-cross the space and add continuity to each area. The bold yellows and blues create a playful disparity with the traditional office greys and whites. All this was provided for at low cost and provides end users with a bright and invigorating space to work.